One of my favorite Halloween stories is The Legend of Sleepy Hollow. The spooky story is one that conjures images of foggy forest pathways, a full moon with dark, wispy clouds creeping over its surface, and that feeling of someone chasing you in the pitch black of night. This cocktail brings that image to life. The rosemary gives a woodsy appeal in the form of a garnish and a sweet syrup. The dry ice provides the fog. And the bourbon...well, does one really need a reason to have bourbon? It seemed an appropriate choice. In the end, this is really just a twist on the classic Old Fashioned. 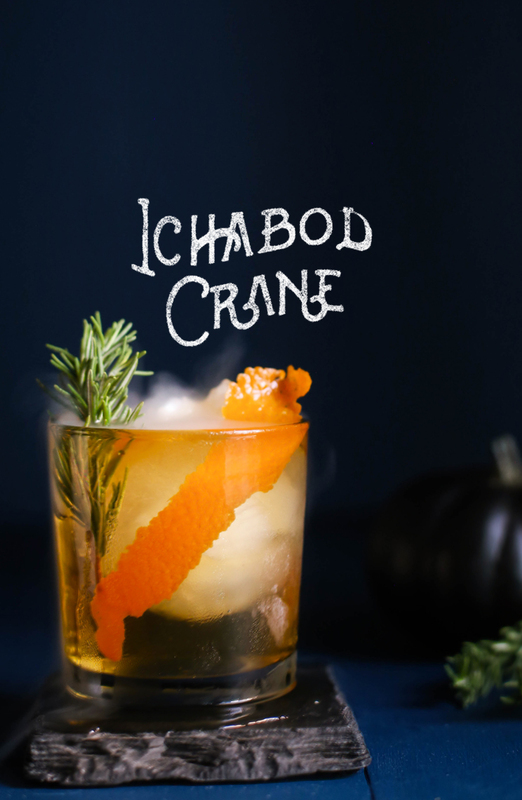 A sturdy, steadfast drink to calm even the jumpiest of nerves on Halloween night. Ichabod could have used one or two of these, don't you think? *Note: You can use the dry ice but it is not required. If you do use it, make sure no one gets it in their mouth. Ouch. Put the simple syrup and bitters in an old fashioned glass and stir to combine. Fill the glass with ice and add the bourbon. Add the dry ice, if using, and push to the bottom of the glass with a stir stick or spoon. Garnish with an orange twist and a sprig of rosemary. Combine the water and sugar in a small saucepan over medium heat. Once the sugar has dissolved, add 2 of the rosemary sprigs and barely simmer for about 5 minutes. Remove from the heat, add the remaining 2 rosemary sprigs and allow to cool. Once cooled, transfer the syrup with the rosemary sprigs to an airtight container and refrigerate overnight. Strain before using the syrup. *Syrup will stay fresh for 1 week in the refrigerator.